In 2015, while recovering from a heart-attack at St. Mary’s Hospital, artist Tony Fitzpatrick was told by his nurse about her best friend’s artist son, Danny Torres. They eventually met, and Fitzpatrick loved Torres’ work so much that he took Torres under his wing, giving him advice and ultimately hosting a show for him that is currently running at his AdventureLand Gallery, 1513 N. Western Avenue. Torres, now 30, grew up in the Northwest Side neighborhoods of Logan Square and Portage Park before moving to Glenview to start high school. After high school, Torres, who has been drawing most of his life, said he attended a local community college for a couple years but failed everything except drawing classes, which confirmed to him that art was his path. He then transferred and earned a degree from the American Academy of Art downtown before getting a graduate degree at the Maryland Institute College of Art in Baltimore. It was not long after graduating from MICA that Torres met Fitzpatrick, who he credits for jump-starting his career. 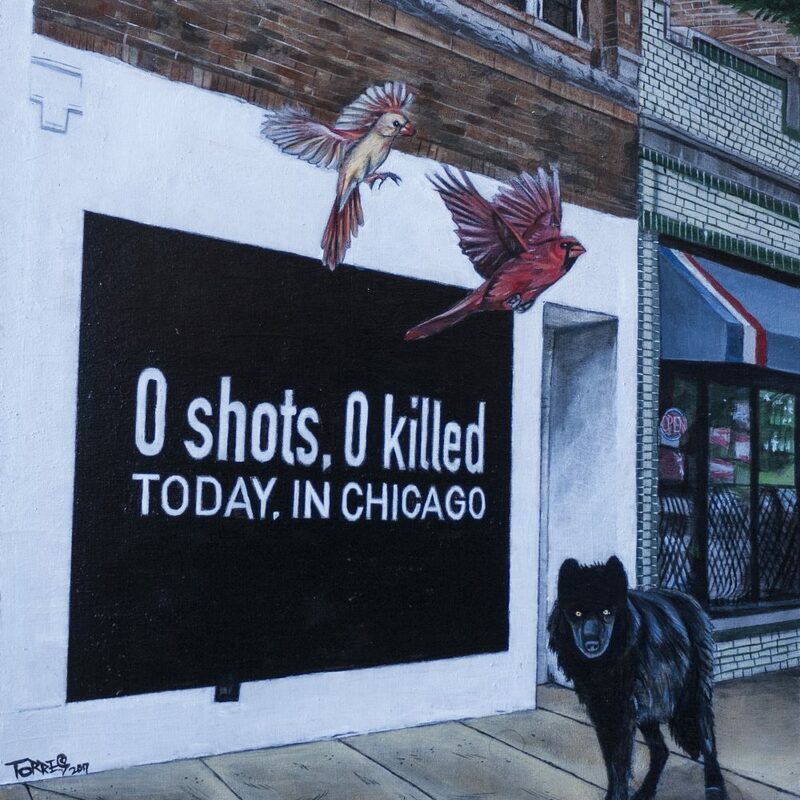 And while the revered Chicago-based artist may have gave Torres a head-start by hosting a show for him, he is quick to point out that Torres belongs in the art scene. Confirming what Fitzpatrick claims is the reaction of the crowd that attended the opening of the show — which quickly bought up 9 of 15 pieces on display. 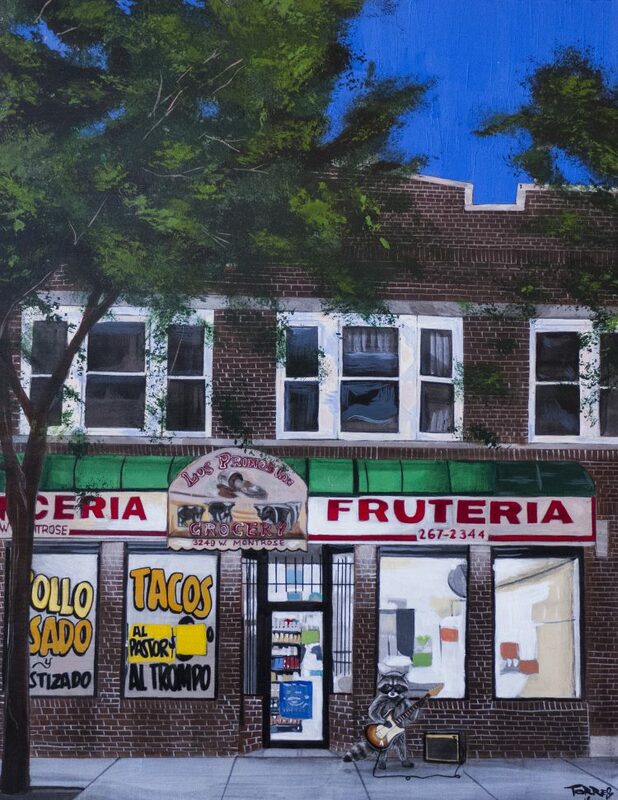 Bob Chiarito of The Chicago Ambassador recently sat down with Torres to talk about his work and his plans for the future now that he has emerged as a professional artist. CA) You sold 9 of 15 pieces on the opening night which is fantastic for anyone, let alone an artist that most haven’t heard of yet. TORRES) Yeah, it was on Friday the 13th and couldn’t have gone any better. I’m a huge horror movie fan, so the only better day would have been Halloween. CA) When did Tony come up with the idea of hosting a show for you? TORRES) I think around November of 2016. We talked about doing it in December 2017 but I asked for an extension because I had some freelance work to finish. CA) All the pieces in the show were done in the last year or two. Were you showing the pieces to Tony as you were doing them? TORRES) Yeah. I showed him the first batch when I was seven or eight months into it and then I’d update him as time went on. CA) What type of feedback were you getting from him? TORRES) He loved it. It was all positive. I’m humbled that he liked the work so much. CA) It seem like lately, or maybe not just lately — but he’s been taking unknown artists under his wing. TORRES) I think that’s part of the process. You have to shine yourself as an artist but once you’ve done that you have to share it. CA) Yeah, that’s what it seems like with him. He’s still obviously a working artist but he gives back a lot. TORRES) Yes. It’s really good of him. Art is such a tough field because you can go to art school and learn to draw something perfectly but no one really teaches you how to be an artist, how to deal with the experience of it. It can be a scary place so it’s good to have a mentor who can tell you to keep going and walk you through things. CA) There’s a lot of leeches in the art industry so it’s great to have someone like him on your side. Tony, as most know, has never been afraid to speak his mind. TORRES) Yeah, you can’t ask for a better quality. CA) To get back to your painting, how do you decide what to paint? TORRES) I get visions in my mind. It could be as simple as walking down the street and I see something that is glowing at me and I’ll take a picture of it. If not that, I’ll see images in my head and try to replicate it. CA) How long does it normally take for you to complete a piece? TORRES) Anywhere from a week to a couple months. It all depends on what’s driving me. CA) Do you usually focus on one piece at a time? TORRES) I used to just focus on one but I’ve been finding it easier to work on a couple things at once to spread my attention around. Sometimes I get frustrated just working on one thing so it would be hard to get anything done if I couldn’t shift and turn to the other when that happens. CA) Was this show the first time you’ve sold your work? TORRES) I’ve had work commissioned before but this was my first solo show. CA) What’s next for you after this? TORRES) I’m looking to do another solo show. I want to build another body of work and show that. I also want to write a short-story comic book within the next year. 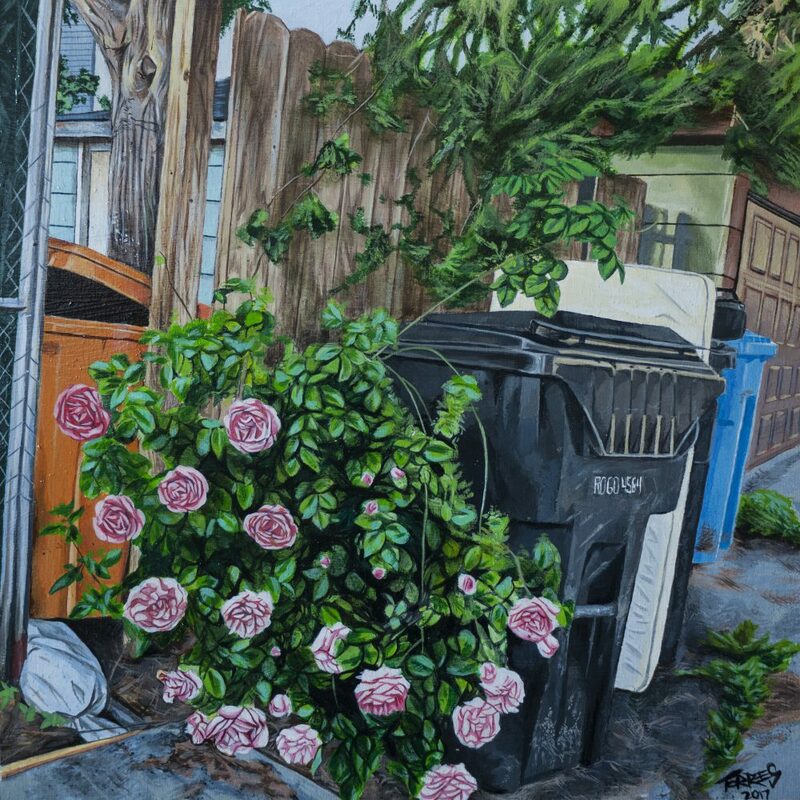 Danny Torres’ work will be on display at AdventureLand Gallery, 1513 N. Western Avenue, through August 13.